Tap instead of swiping to answer & end calls? On my S8+ running Oreo I was able to tap to answer & end phone calls. 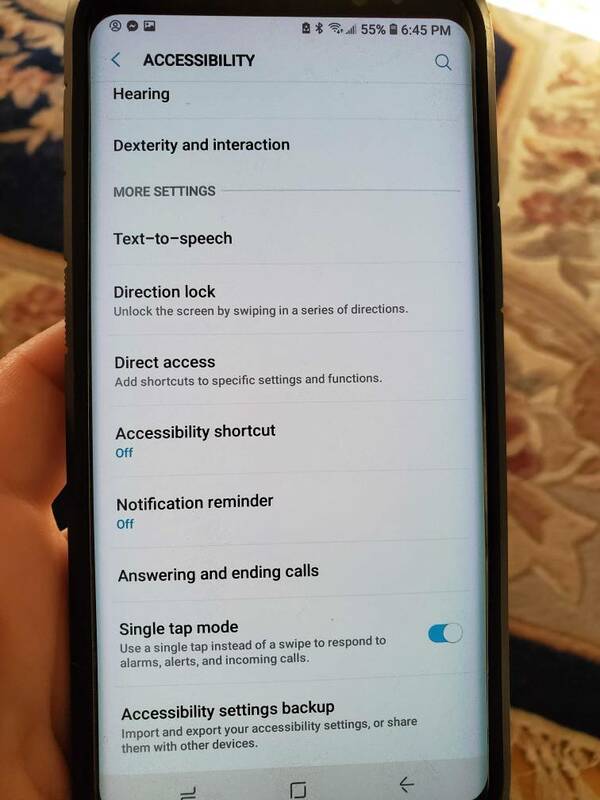 I cannot find it on my S10+ running Pie. Does anyone know if this still exists and where it is? In accessibility settings "one tap"
The easiest way to find it is to search for SINGLE TAP after opening settings. I kept searching for tapping. Graines and GrooveRite like this. What is a floating icon? Ok so this is all I can find. Now it's gone and I can tap to answer. felloffthetruck, mustang7757 and mach1man like this. Yep, totally confused. Single tap option still doesn't do it and floating icon being talked about not sure about that either. If someone could he super nice and maybe do screen shots? So why won't Samsung use the proximity sensor to just put to your ear to answer a call. No buttons to push, nothing to swipe. HTC and others have done this and it's so much easier to answer a call. How to retrieve calendar entries that have been deleted? how to turn off bluetooth notification sound?